Known only from three collections from Sabal Tapang Forest Reserve, including G Gaharu, in 1st Division. Endemic. Clustering stemless rattan, stem subterranean, very short, without sheaths c. 15 mm diam., with sheaths c. 30 mm diam., internodes very short. 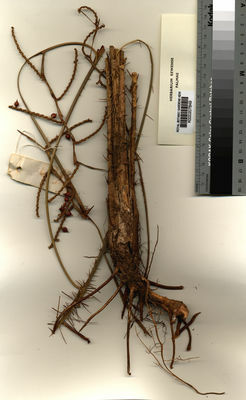 Sheath splitting opposite the petiole for much of its length, dull mid brown, sparsely armed with dark brown spines c. 3 -15 mm, scattered or in groups of 2 - 4, brown hairs present between the spines; knee absent', ocrea thin, c. 10 cm long, bearing minute spines, scattered or in rows, soon tattering. Flagellum absent. Leaf ecirrate, to c. 2 m long, usually less, including the petiole; petiole to 1.25 m, armed with groups of spines 5 -15 mm long; leaflets regularly arranged, distant, (5 -) 10-15 on each side of the rachis, rather thin, narrow linear-lanceolate, the longest to c. 30 x 1.5 cm, the apical pair c. 20 x 1 cm, armed with very sparse short bristles on 3 nerves on the upper surface and 1 nerve beneath, transverse veinlets conspicuous. Inflorescences to 1.3 m, tending to arch or flop along the forest floor, with 2-5 distant partial inflorescences; prophyll and primary bracts tightly sheathing, armed with scattered spines to 10 mm; male rachillae very short, c. 10 x 1.5 mm bearing strictly distichous male flowers; female rachillae few, distant, c. 70 x 2 mm, bearing distichous flowers; rachilla bracts minutely roughened, brown scaly. Mature fruit rounded, c. 9 mm diam., beaked, covered in 15 vertical rows of red-brown scales. Seed rounded, c. 7 mm diam., slightly flattened on one side; endosperm homogeneous. Seedling leaf not known (Fig. 67).